Samsung today announced what it claims is the highest capacity consumer solid state drive, a 4TB member of its 850 EVO line, which will retail for $1,499 or about 36 cents per gigabyte of capacity. The new 850 EVO SSD uses Samsung's 48-layer high V-NAND technology, which stacks flash memory cells one atop another like microscopic skyscrapers and stores three bits per cell. Samsung then crammed the 4TB of capacity into a 2.5-in. SSD form factor only 7mm thick, which is small enough to fit into ultra-slim notebooks. 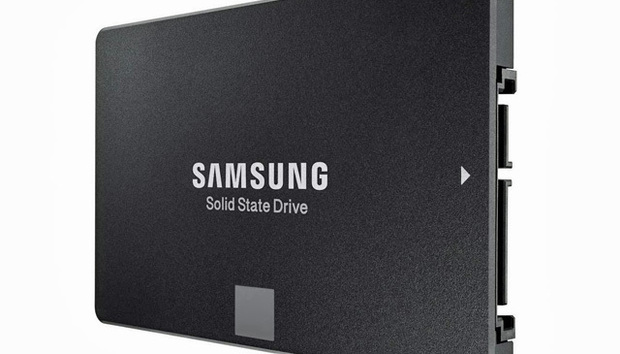 Previously, Samsung's 2TB EVO SSD was its highest capacity flash drive. Samsung's new 850 EVO SSD boxed. The drive also sports native AES-256-bit encryption of Samsung's TurboWrite technology, which the company first unveiled in 2013 in its 840 EVO SSD. TurboWrite creates a high-performance write buffer to which new data is first written. The new SSD has up to 4GB of LPDDRC DRAM cache memory and uses the 6Gbps SATA interface. The 850 EVO has a top sequential read/write speed of 540 MBps and 520 MBps, respectively, and a top random read/write speed of 40,000 and 98,000 I/Os per second (IOPS) when TurboWrite is initiated. With 4TB capacity can store about 1,000 two-hour compressed 1080p full-length movies, Samsung stated, and has a 1.5 million meantime between failures (MTBF) rating. The 850 EVO drive is available for pre-order -- Computerworld found it on online at retail site Adorama.com. The SSD comes with a five-year limited warranty.